The TARDIS returns to contemporary Earth once more, in fact on the exact same day as the events portrayed in ‘The War Machines,’ as suspicious goings-on at Gatwick Airport come under scrutiny and Ben and Polly make their departure. 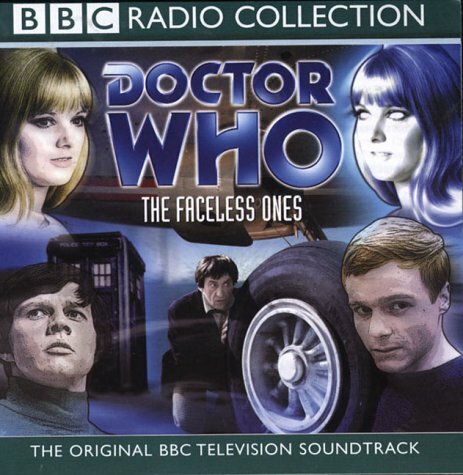 ‘The Faceless Ones’ really starts to show the mischievous charisma and charm that Patrick Troughton has been perfecting over the past few stories. Whether butting heads with airport security or thinking quickly and even threatening others to get out of dangerous situations, Troughton imbues his character with a darker edge that sells the menace of the situation, and the balance between humour and stern intensity is perfect. Notably, this is really the first time that the Doctor and Jamie have truly gotten to interact, and it’s clear that there’s an inherent and easy chemistry between the two that further exemplifies the tonal balance. A small moment like the Doctor warning Jamie not to overdo his acting when pretending to be sick to gain access to the medical ward and bigger set moments like the two hiding behind newspapers or posing in a phone booth all suggest hints of just why Jamie would go on to become such a beloved companion and perfect match for the Second Doctor. In a way, it’s a shame that this is the final episode to really focus on Jamie’s culture shock of arriving in the future, this time seeing airplanes for the first time, but ‘The Faceless Ones’ really ends up being the character’s moment of arrival in terms of lasting legacy. Since Frazer Hines joined the cast after ‘The Highlanders,’ the programme had never really found the perfect balance of liens and action for both Ben and Jamie, and unfortunately ‘The Faceless Ones’ marks the end of Ben and Polly aboard the TARDIS. Realizing that they are back in their own time, they happily take the opportunity to return to their old lives, though the end result in still quite rushed. There have been suggestions that Anneke Wills was offered the opportunity to stay on as Polly, but her decision to leave alongside Michael Craze highlights how deep the connection between the two companions is, and the Doctor intimates that the two do, indeed, have a long future together. It’s a shame that these two companions so forgotten in time due to the extent of their stories wiped from the video archives are not offered more to do in what ends up being their farewell serial, but they will always be remembered for their young energy and fierce loyalty as well as guiding the show during its first lead regeneration. ‘The Faceless Ones’ features some nice location work at Gatwick, and the script wastes absolutely no time in setting events in motion as the TARDIS lands in the path of a jet and the companions must quickly go in separate directions. Getting to the nefarious truth behind Chameleon Tours does take longer than needed, but the journey there is still filled with some very powerful images and moments, Polly coming upon a murder scene and the rasping body in the hospital bed just two of many. Yet it’s the cliffhanger to the third episode where the camera slowly reveals that all of the youth aboard the plane are missing that chillingly highlights the tension best. Having an ordinary airplane be commandeered by an alien race who is able to pilot it into space, its disappearance from radar on Earth being attributed to a crash into the ocean, is a frightening one that toys with an everyday aspect of life incredibly well. The alien doppelgangers work to good effect as well, adding another level of disconcerting menace and supporting the Chameleon moniker. The visuals of the aliens taking on the appearance of their human targets are well-realized and, even if their plan does ultimately fail, it’s a nice chance of pace to find a race that simply wants to survive on a new world after their own was destroyed, regardless of how horribly and inexcusably misguided their attempts are. Once the plane takes to the sky, ‘The Faceless Ones’ becomes a very dynamic and action-driven piece, becoming something quite unlike Doctor Who’s usual self but an utter joy nonetheless. Pauline Collins as Samantha Briggs makes a strong case to become a companion herself as she showcases bravery, resourcefulness, and confidence, even sharing a kiss with Jamie, a rarity in the classic series. With the departure of Ben and Polly highlighting a long sequence of farewells, the door was certainly open for a new female companion, but it was not to be, leaving a series of what-ifs surrounding Samantha. At six parts long, the story does suffer from bouts of repetition and padding, oftentimes putting Troughton in the same position as he must explain again and again what he believes. Likewise, though the pacing is fairly good throughout, it does sometimes completely grind to a halt, strangely notable many times that the villainous Blane appears. The idea of the disappeared children writing postcards to their family ensuring them of their arrival and happiness is a clever conceit, but it’s hard to believe that a postcard by itself would be enough to keep suspicions from being arisen. In the end, the six parts could easily have been condensed to a much more snappy four without missing too much. As it is, the initial claustrophobic mystery followed by the intriguing action is still a strong serial that brings into focus the burgeoning camaraderie between the Doctor and Jamie in a contemporary thriller that also mishandles the hasty departure of two beloved companions.